Create innovative styling or just amplify curls to add volume to your clients’ hair. 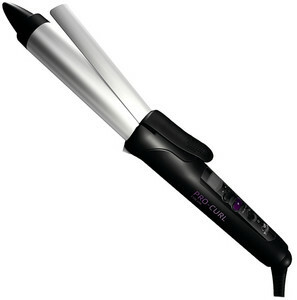 The simple and yet efficiently compatible handling of the PRO-CURL COLOR makes it the definitive curling iron for professional styling with enhanced color protection. Up to 55% less color fading thanks to the Color Save Mode, with one-touch activation. Color Save Technology - prevents moisture loss and helps quickly replenish the natural moisture balance of colored hair. Ceramic - ceramic care barrel for gentle gliding and sensitive hair end protection. Ionic function - with powerful ion flow reduces static charging for glossy, shiny results. Customize temperature - in 10°C increments via digital display. Ideal to recommend/sell to your client.